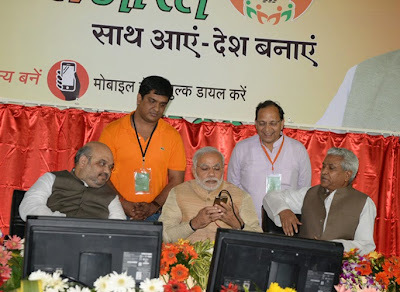 “BJP’s membership campaign kicked off on 1st Nov 2014 where PM Narendra Modi became the first member by the national president Amit Shah. Since then, the party has crossed a figure of one crore from all over India. In an earlier campaign done six years ago, the number reached three crores. This membership campaign is different in more than one way. To begin with, a political party has made use of the technology which is a unique experiment, not only for BJP but for all political parties. This will make other parties take notice and change their traditional ways of functioning. This campaign will undoubtedly have long-term effect on Indian politics. In the past, the party workers approached people to become members or so they projected! But with this new method of giving missed calls, we have ensured transparency in the membership process. Earlier it wasn’t easy for people to directly participate but now membership is open to everyone. So, when we appealed to people to be members on 1st Nov, around 7 lakh people registered from all over within few hours! It was an overwhelming response! Looking back, we have come a long way since Jan Sangh days in 1951. That was a difficult time for the Jan Sangh and nobody wanted to be associated with it. Gandhiji’s assassination was fresh in the public memory and there were needless attempts to blame the Jan Sangh for it. Also, the freedom struggle against the British rule was fresh under the Congress leadership. Congress leaders were actively leading on all levels. Nehru was a very tall leader then and had a huge influence on the masses. On this backdrop, it was a challenge in itself to reach out to people with a different and that too, a tarnished ideology. In 1980, BJP came into being after splitting from Janata Party but even this was a tough time for the party in terms of public support. In 1970, the students’ movement (Navnirman Andolan) against the political corruption gained momentum under the leadership of Jaiprakash Narayan. What followed was a fight against emergency and Janata party’s short-lived government. These events somewhat eased the public sentiment against the Jan Sangh but still there was no acceptance of their ideology. So in a way, it was a new beginning all over again for the BJP. Between1980 to 2009, the party tried various drives, experiments and campaigns to spread its wings but met with a limited success. The party could not grow strongly in all parts of the country. There is no denying that we didn’t have effective presence in three parts of the country like South India and North East and Eastern India. After 2012 though, the political scene changed rapidly with BJP consistently winning Gujarat, Madhya Pradesh and Chattisgarh. Our leaders from these states lived upto people’s expectations and that too in a difficult time when the country’s economy was not doing well. These three states performed quite well in agriculture, industrial and social spheres which naturally attracted people to us. All over India, especially in Maharashtra, the political corruption was at its peak but these three states had no corruption which didn’t go unnoticed by people. All these led to a public opinion of BJP being a party with an agenda of all-inclusive growth and good governance. In addition, the rise of Narendra Modi's leadership and his charisma was also one of the factors that turned the things around for the party. Despite numerous hurdles and opposition from every quarter, he developed Gujarat which was duly appreciated. In comparison to leaderships of other political parties, Modij’s leadership was a welcome change that helped BJP’s credibility and popularity grow by leaps n bounds. Earlier, despite door to door campaigns, we failed to get many supporters but things have reversed today. People are approaching party offices to join. In the past too, people have shown support to various parties but never this strong! Five to seven years after 1947, people wanted to become congress members. West Bengal and Kerala, saw the support of people to the communists. Recently, Anna Hazare’s agitation in Delhi attracted people for a short time on which AAP capitalised. Very informative article with some history in it, Always a good thought from you Sir, Vande mataram & yes I have registered my self via missed call. This was a nice membership experience.